I suppose it could be said that Disney's latest 3D-animated feature film has been of their most anticipated since their split with 3D megastudio, PIXAR. Okay, so it's actually Disney's first effort sans the aforementioned Bay Area studio. So the question floating in the air is "Has the sky really started to fall for Disney?" CHICKEN LITTLE, the film, seems to ooze with "cuteness" and fun-loving parody...enough that is sure to bring in bug-eyed children thirsty for some Incredible-Monster-like-Nemo-magic, while their parents...well hope for the same. The soundtrack runs 75% pop, vocal and 25% score. With a total runtime of just under 40 minutes, that means there isn't a whole bunch a score here. What there is of Mr. Versatile, John Debney's, score is about what one would expect for a film like this. "The Sky is Falling" begins the five tracks of actual score with a rousing, choral romp, while the longest piece, "The Big Game" delivers a slightly patriotic, militaristic note. "Dodgeball" clearly nods to ye ol' school cartoon musical tradition of Warner Brothers. Lastly, CHICKEN LITTLE comes to a somewhat lack-luster close with the tender "Driving with Dad." The beginning three-quarters of this release offers very little enjoyable music, although I do admit to a small chuckle when listening to Chicken Little's rendition of "We are the Champions." 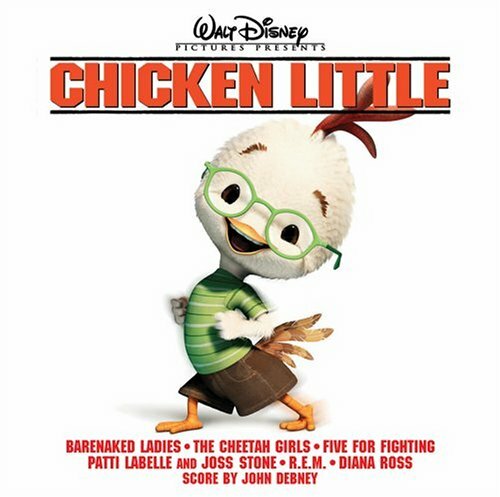 What there is of the score is certainly serviceable, as most John Debney's scores are; however, there is again "little" that helps to cause CHICKEN LITTLE to stand out.